We’re counting down the five most popular songs in the Billboard Hot 100 Pop Singles Chart, for the week ending June 6, 2015. The Canadian singer was one of several headliners at the eighth annual Roots Picnic in Philadelphia last weekend. Hosted by the famed rap group The Roots, this year’s event also featured DJ Mustard, A.$.A.P. Rocky, and Erykah Badu. 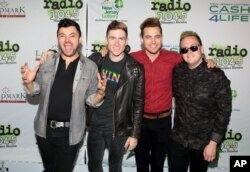 FILE - Eli Maiman, from left, Nicholas Petricca, Kevin Ray and Sean Waugaman of the band Walk the Moon pose for photographers. Holding in fourth place, we have Walk The Moon, whose members say they have an advantage over other bands. I’ll have details after “Shut Up And Dance.” This Cincinnati, Ohio band started five years ago, when music student Nick Petricca met the other three members…who were also music majors. Nick says their academic background enables them to write on a “different level” than competing bands. Fetty Wap, left, and Pete Wentz perform at the MTV Movie Awards at the Nokia Theater, on April 12, 2015, in Los Angeles. Wiz Khalifa arrives at the Billboard Music Awards at the MGM Grand Garden Arena, May 17, 2015, in Las Vegas. Here’s your tip-off that something big happens this week: Wiz Khalifa and Charlie Puth are no longer your champs. They end their six-week stint at the top, as “See You Again” falls to number two. Wiz hopes to keep the momentum alive as he tours North America with Fall Out Boy…they’re on the road together through August 10. Singer Taylor Swift poses at the 2015 iHeartRadio Music Awards. When Taylor Swift does something, she does it big. Her fourth career Hot 100 championship happens this week, as “Bad Blood” rockets from 53rd to first place. Kendrick Lamar appears on the single mix, and this gives Kendrick his very first Hot 100 victory. More than ever, it pays to be a friend of Taylor! And so we come to the end of another countdown. Join us next week for an all-new lineup.